As warmer spring weather sets in, the attention some cannabis growers shifts to outdoor operations. For many home cultivators, however, this is not an option. Unfortunately, a variety of factors like close neighbors or the possibility of adverse weather year-round may make the prospect of an outdoor grow risky or impossible. If this is your situation, there is no reason for despair, because there is plenty of things you can accomplish with a well-strategized indoor grow this spring. There is no reason to halt your cultivation projects, but the spring months present great opportunities to tend to cultivation chores and rethink any changes in strategy. It makes a good time to reevaluate. 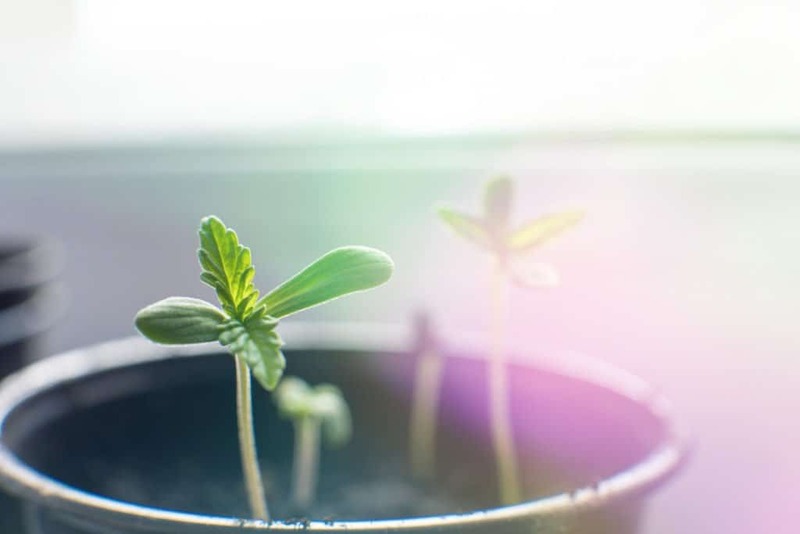 It pays to pause and consider how you may be able to improve your cultivation practices to improve potency, terpene development and overall flavor, as well as overall yield. The term “spring cleaning” is commonly used at this time of year, and for good reason. Spring provides an excellent reason to get down to the nitty gritty and do a deep cleaning. Dust and dirt can build up during the cold, dreary days of winter when the door remain closed more often and air doesn’t circulate as much. Furnaces are known for coughing up dust that can layer rooms and collect in the nooks and crannies of a home—and a grow room. Spring is sometimes the first opportunity in months to open all the doors and air out a home. Because of the mild weather, conditions are more conducive to large-scale home improvement projects that require the removal or re-arrangement of furniture, and this applies to grow room equipment and arrangement as well. If you had any undesirable things happen with your grow during the past year, this is the time for preventative maintenance—particularly if your problem is one that’s avoidable with some small but critical changes. Did you have an outbreak of white powdery mildew or spider mites? If so, you want to empty your cultivation area and address the problems. White powdery mildew indicates you would benefit from increased ventilation and air circulation since this is a serious but avoidable problem. Additional vents and fans may do the trick for a solution. Likewise, a spider mite infestation can explode into a huge and persistent nightmare if the little beasties aren’t completely eradicated. Now is the time to clear the room and treat the entire space not once, but twice, to ensure that no spider mites remain. All if takes is a few mites to hatch when you think you’ve solved the problem with only one treatment to kill live mites but not address the eggs that will hatch. They establish themselves quickly. Cultivation room spring cleaning should be thorough. A clean and tidy grow area is an efficient and productive grow area. The best practice is to remove everything for a thorough sweeping and washing of floors and washing of walls to eliminate any dust or cobwebs that may be hiding in corners. If you have white paint and would prefer mylar on your walls. Now is the time to make the change. Cultivation equipment should go through an evaluation at least once per year to make sure everything is in tip-top shape. Have you thought about switching your lighting from HID (high-pressure sodium or metal halide) to LED (light-emitting diode)? Now would be the time to do it. Although the initial cash outlay will be greater than new HIDs cost, the operating cost will be significantly lower and the lights will last longer, which will recoup the purchase price over time. If no changes to lighting units are necessary, it’s likely you will benefit from new bulbs if you use HID units. Many growers fail to replace their bulbs often enough and wait for them to burn out completely—which is definitely waiting too long. A better practice is to replace bulbs after ever second or third crop. If not replaced this often, the performance of HID bulbs will reduce and overall yield will suffer. If you think your bulbs will be good for another grow, at the very least dust them of with a damp rag when the lights are off and completely cool. You will likely be surprised at the dust and grime that you see on the rag when done. That dust is blocking important—and expensive—full-spectrum light from reaching your plants. If you’re using old and dusty lights, there is definitely room for improvement in your overall general maintenance practices. If you repurpose soil, strongly consider new soil for every grow. If you can’t commit to doing it for every crop, perhaps every other time, with as much of the root material removed from your pots as possible. Hardened, clumpy bits of soil and root material will restrict vigorous root development from the new plants that will occupy the pots. New soil for each grow—which is the best course of action—should be an organic mix filled with ingredients like kelp meal, blood meal, earthworm castings, bat guano and other things that will coax the best possible flavor from your plants. If your organic mix comes pre-loaded with these ingredients, the young plants that grow in it will not require soil additives for the first few weeks at least. Hitting them with soil amendments could easily be too much of a good thing and cause nutrient burn that will discolor leaves and curl leaf tips. Soil amendments should also be organic, or as organic as possible from a bottle. Many bottled mixes can come very close. If you have access to compost or can build an outdoor compost pile, by all means do so and use it. Sprig is the perfect time to begin a compost pile. Composting takes little effort and the “black gold” compost that results is packed with organic nutrients and is free, making it not only a superior soil amendment, but one that’s more than affordable. The organic approach will definitely pay off once you harvest and let your buds cure slowly and properly, first hung to dry and then slow-cured in jars. The smooth, flavorful smoke will put a smile on any cannabis lover’s face. Once the essentials equipment for your spring cultivation project is assembled, the fun part of selecting what strains to grow is the final decision you need to make. You also need to decide if you will grow from clones or seeds. If clones are available in your area, they provide more certainty about what your final harvest will look like as far as quality and yield go. In short, clones provide a more known outcome because the mother plant is already a known quantity. Seeds are another good way to go, and with worldwide shipping of seeds from a variety of seed banks, they are more readily available than clones. Many top strains are available in seed form, and although some of these strains can have several phenotypes, many of them can be quite good. They may be even better than clones, but you also stand the chance of getting lower quality. Seeds are more of a gamble but are definitely a great way to obtain excellent genetics for your spring grow. If you want to decide the best and most popular of the newer strains you might be able to grow from clone or seed, go online and many cannabis sites will list the most potent and popular strains from the previous year—or even the strains to look for during the present year. Among the sativas and indicas that fit the most popular and potent category this spring are some exciting new varieties as well as some old favorites. For your spring 2019 grow, keep your eyes out for Sunset Sherbert, Gorilla Glue #4, Zkittles, Godfather OG, Irish Cream, Key Lime Pie, Chemdawg, Forbidden Fruit, Strawberry Banana, Purple Punch, White Tahoe Cookies, and Do-Si-Dos. With a little bit of planning and critical evaluation of your cultivation practices, this year’s spring grow could be your best ever. Cutting corners and taking the lazy approach with various aspects of your grow will detract from the final quality of your harvest and, obviously, you want to grow the best flower possible. Do everything properly and by the book, and you will definitely be happy with the results!